I've just purchased a 1997 Frontera A (burgundy) 2.2Ti with 58K on the clock and 1 owner from new. On the face of it it's a really honest car with engine, gearbox etc. totally smooth and pretty straight bodywork and interior. I bought the car knowing the brakes needed some attention and front suspension ball joints as they were advisories on the MOT. I also since noticed a leaky rear diff (failed cover) and leaky engine (failed rocker cover gasket). Anyway, although I'm fairly handy with the spanners I gave it to my local mechanic that I trust to check it over and address the above. Brakes, Suspension, Diff and oil leak are all pretty straightforward my issue is that there is a cross member below the radiator which I noticed looked a bit rotten but I didn't think was structural hence passing an MOT (although I'm sure there are plenty of dodgy MOT centres around) but I asked them to take a look. The garage think it is structural and reckon about 5hrs labour plus the part (if they can get one). My issue is I bought the car as seen and it was cheap (£900), the seller has agreed to knock a few quid off also but not return the vehicle. I'm fully prepared to spend a few quid on it and I'm happy to sort the brakes, leaks, suspension but I wonder if anyone can shed an opinion on the chassis member (whether it is actually structural and if so whether I'm likely to find a part). I work from home so I'm only gonna be using the car as a local runaround mainly so part of me thinks get the other bits done and take a risk (and keep an eye on) the cross member. Hate for this to be my first post but any advice (however brutal) would be welcomed. Second hand for cross member unless you can make/ repair it. If it's gone within the prescribed area of the body mount then it's a fail , if they see it. Is there a separate member that the radiator mounts to? I've spoken to the MOT place that I use and he seems to think that it's not structural but obviously is important as it holds the rad. Assuming that's the case I think I can get someone to fabricate a replacement as looking around I think I'll struggle to get the correct part. This 'crossmember' is a part of the bodywork and can be welded as shown above. 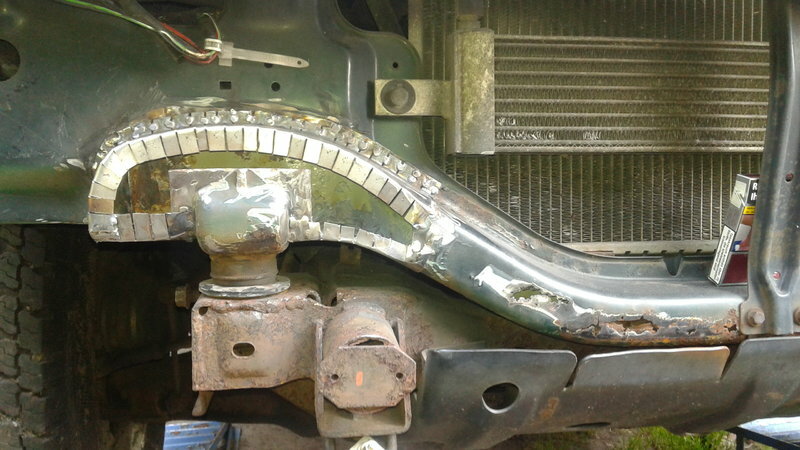 A few years ago here someone posted an image of his repair - replaced the whole front-mask took from a donor truck. That's great. Thanks for the pic. Probably worth getting in touch with Greg to see if he can cut one from a donor vehicle. It would help if you could post a few pics of the problem, we could then be a bit more 'focused' in any advice/help offered. In respect to what you may see as a total loss on a panel or structural section we may (probably have) already been there and sorted it by some patch repairs. It will also help Greg cut the right bits out if he can see just what's needed. As for the rear diff cover, catch it early they can be easily repaired, Greg had quite a line going with those once. Don't know if he still does them, if not then ask around on here you never know what folks are falling over in their sheds! Finally, if you cant weld already.... You've just bought a Fronty, so it's time to learn. They aren't as bad as others (disco for instance) for rot, but they are getting on now and if used properly will get a battering! I now have the car back so will take a few pics and add them then contact Greg. The diff issue was just a gasket in the end so that is now done and seems to have done the trick. I can't weld (yet ) but I do know someone local who can and should be able to help me out. Previously I had a Range Rover P38 so I'm very used to fixing things although with that it was generally electronic. 02 shows the main crack. Please can you let me know Greg's username.